This weekend I got an email from my friend Nancy telling me about some cinnamon flavored cookies she’d found at her local gourmet store. Since Nancy was the one who turned me on to Sheila’s Cookie Brittle and inspired the homemade version I called Brownie Bark, I associated Nancy’s cinnamon cookies with cookie bark, and the idea for “Snickerdoodle Cookie Bark” was born. Luckily, I didn’t have to do much work to come up with a sugar cookie (non-cocoa) version because my friend Carolyn in Canada had already done so using the brownie bark. All I had to do was take Carolyn’s sugar cookie version and incorporate some cinnamon sugar. Carolyn’s version combined with cinnamon was great. And while I did test the idea of incorporating a little oil in place of butter to keep it from browning so quickly, I decided that Carolyn’s all-butter version had more flavor. Just keep an eye on it so it doesn’t burn. And most importantly, use a good cinnamon. Another reason I made this was because last week I bought some Penzey’s Vietnamese Cinnamon. They have other interesting varieties of cinnamon including Indonesian and Chinese, but the Vietnamese is my favorite. I’m pretty sure that for an hour or so, our house was the best smelling place on the block! 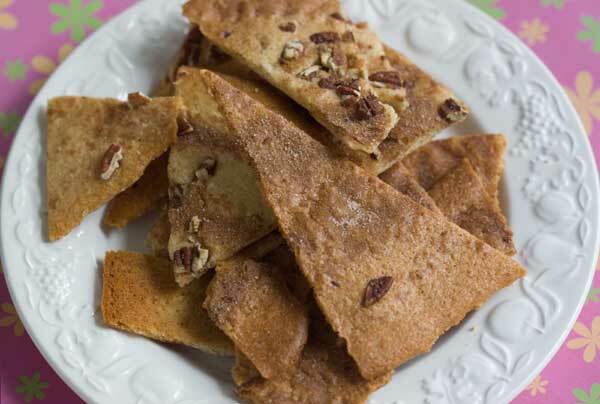 Cinnamon sugar topped version of cookie brittle or cookie bark. Set the rack to the lower center part of the oven and preheat to 325 degrees F.
Line a heavy duty 13×18 inch baking sheet with nonstick foil or parchment paper. In a mixing bowl, vigorously whisk the egg whites until very foamy. Gradually whisk in the sugar, then whisk in the melted butter and vanilla until smooth. Whisk in the salt, baking powder and cinnamon, then whisk in the nonfat milk powder. Add the flour and stir until smooth. Empty batter onto the lined cookie sheet and spread as thinly as possible using the back of a spoon or scraper. Mix together the cinnamon and sugar and sprinkle evenly over the top. If using pecans, sprinkle them on top. Bake in the lower center of the oven for 17- 20 minutes, checking at 17 minutes. Edges should be brown but not burnt. Remove from oven. With a pizza cutter or knife, immediately cut into pieces without separating – you want shards, similar to what you’d get if making peanut brittle. Let cool completely. If you are left with a few thick, chewy, pieces, return them to the oven and bake at 250 for 20 minutes, then re-cool. If your batter is thin enough the first time, you should not need the second bake. Hi Emily! I hope you love it. Love this–definitely different and I can just imagine the smell. Yum! Pinning for the holidays! This idea is SUPER cool! A platter of this and your famous toffee during the holidays will be killer. My dad would love all these cookie bark cookies because he prefers crunchy cookies. Growing up I used to always have to “burn” or at least way over bake chocolate chip cookies for him because he liked them that way. I posted your criss cross peanut butter cookies today. Posted them poorly back in 2008 and made them again, they really are the perfect pb cookie. These look delicious! There’s a Penzey’s near my office that I’ve been meaning to check out, and now I’ve got a perfect excuse to go there! Can’t wait to try these. Hooray! Glad I didn’t mess it up ;). I made this tonight. It’s fantastic! Wow, this is so creative and looks seriously yummy! I’m really interested in how the Vietnamese cinnamon tastes? Oh wow! I am going to have to bring a sample platter of all your cookie/brownie recipes to work! This should freeze well, right? I’m sure I would want to eat this like popcorn. It looks really good. Thank you for the acknowledgement! I can’t wait to try this version! Looks so yummy! These look so addictive they should be called Snickerdoodle Crack!